Lots of people have written to ask us where to find cribs for twins. While standard singleton cribs will work perfectly well for twins too, of course, it turns out there are at least six different types of cribs on the market today made especially for twins. We describe them all, and tell you where to find them, on this page. We have no affiliation with any of these merchants. The Duetta Crib Mate is the only crib we found that can work well for triplets (or quads or quints) as well as for twins. You can configure these patented round cribs in different ways. Attached to each other, they provide a shared space for two babies. You can also use them separately, when your babies get older or need separate sleeping spaces. You can attach three of these cribs together if you have triplets … or even more, for more babies. We also like round cribs because they have no corners – so the baby can’t possibly get her little arm or foot stuck in between the mattress and a corner of the crib. These round cribs are 45 inches in diameter. They use less floor space than standard rectangular cribs (which measure 50” by 27”). 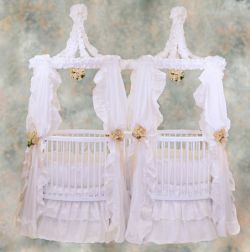 The Duetta cribs for twins have dropsides that lower eleven inches, to make it easy to lift baby in and out. The mattress can be adjusted to multiple height positions as your baby grows. The cribs are made of white birch and white maple (North American hardwoods). They’re made in America. Several finishes are available. The Duetta comes with two waterproof, high-density foam crib mattresses. The manufacturer offers tons of bedding options for these cribs, but standard round crib bedding will do as well and can be more affordable. Little Miss Liberty also offers coordinating canopies, draperies, wall hangings, furniture, lamps and toy chests. Downside: the Duetta Crib Mate is probably the most expensive of the special cribs for twins. You can order it through Cribs.com and get free shipping. For smaller nurseries, a Double-Decker Crib takes up much less floor space than all the other twin crib options. It’s also the most affordable of all the special cribs for twins. These cribs are stacked, one on top of the other … bunk beds for babies! These bunk-style cribs take up only 6 square feet of floor space. (All the other options listed on this page take up 16 square feet or more.) The double-decker crib is 71 inches tall. This crib comes with two 3-inch-thick, vinyl-covered foam mattresses. You can order it through Cribs.com and get free shipping. While more expensive than the double-decker option, the Pamco Twin Crib offered at Kiwi Kid can also be considered economical in the long run, since it can convert into two single beds when the babies outgrow the crib. However, it uses 21 square feet of floor space rather than the 6 square feet the baby bunks do. The Pamco has independent dropsides that are operable with one hand. The mattress can be placed at two different heights. You can remove the front panels of this crib when the twins are old enough to climb in and out themselves. This crib comes with a foam mattress (or an innerspring mattress for $150 more) and one sheet set. It measures 82 inches by 39 inches, and can convert into two single beds. The Baby Trilogy corner cribs are intriguing, and can work especially well as cribs for twins. Each crib is wedge-shaped (like a quarter of a pie). These are another good choice for small nurseries, since beds placed in corners take up less usable wall space. Some parents of twins choose to put one crib in each of two corners of the nursery. These cribs can also be placed side-by-side on one wall, making a charming effect with a complete semicircle of spindles. Each corner crib measures 40 inches on a side and 60 inches on the curved edge. They are available with or without canopies, in a variety of finishes. One downside of the corner crib? It takes special bedding that can be quite expensive, and is harder to find than standard rectangular or round crib bedding. Twins Things, a company based in the UK, offers three different kinds of cribs for twins. They will ship internationally. Twins Things’ natural wicker Twin Cribs can be joined side by side, or set up as stand-alone cribs. The Twin Cot (which is the Pamco twin crib described above) is basically an extra-long rectangular crib with a removable divider, convertible into two single beds. The Twin Sleeper is an L-shaped crib to place in a corner, that can be used with or without a diagonal divider between the twins. These cribs for twins convert into toddler beds and then into an L-shaped sofa. It takes specially made sheets. We get e-mails from parents trying to find an L-shaped crib for sale in the United States. A company called More Than One used to offer a twin crib like that. (It was like two standard cribs joined together, that went in a corner). But this L-crib is no longer available new.